The Judicial Performance Commission of the Twentieth Judicial District recommends that Judge Judith L. LaBuda BE RETAINED by a vote of 9-1. Judge LaBuda was appointed to Boulder District Court in May, 2012. She earned her law degree from the University of Colorado in 1992. She received a master’s degree in rehabilitation counseling psychology from the University of Wisconsin in 1981. She practiced in the rehabilitation field for 10 years prior to receiving her law degree. As a trial attorney in private practice from 1992 to 2009, she practiced in state and federal court, focusing on family, employment and disability law. Prior to her current appointment she was Assistant Attorney General, representing the State Personnel Board and Division of Insurance. Judge LaBuda’s current caseload consists primarily of domestic relations cases with some civil cases. She has had limited exposure to criminal matters and has yet to serve in a criminal rotation. For this review, the Commission considered responses to anonymous surveys sent to attorneys and non-attorneys that appeared in Judge LaBuda’s courtroom, a self-evaluation, unannounced visits to her courtroom, several of her written opinions, and an interview with Judge LaBuda. The Commission also held a public hearing soliciting further information regarding all judges standing for retention. Survey results were mixed. Some participants described Judge LaBuda as smart, hard-working and knowledgeable. Others indicated that she can be disrespectful, imperious and inflexible. Judge LaBuda received an overall grade of 3.30 out of 4 across all categories of survey evaluation, lower than the average overall grade of 3.50 for district court judges statewide. Among attorneys surveyed about retention, 68% recommended to retain, 18% not to retain, and 15% made no recommendation. Among non-attorneys, 66% recommended to retain, 16% not to retain, and 18% made no recommendation. The Commission believes that Judge LaBuda is diligent, efficient and knowledgeable about the law. The survey reveals, however, that her courtroom demeanor and procedural management could be improved. Attorneys report that she does not always treat participants with respect and non-attorneys perceive her as lacking in compassion and understanding. There is a consistent theme in the comments suggesting that Judge LaBuda’s concern for procedural efficiency gets in the way of her capacity to listen to and understand substantive issues. Attorneys expressed concern that Judge LaBuda does not allot sufficient time for complex cases, to allow issues to be properly addressed, and does not always show good judgment in the application of relevant law. Judge LaBuda acknowledged the negative perceptions reflected in the survey and has agreed to work on improving her demeanor, flexibility and human understanding. 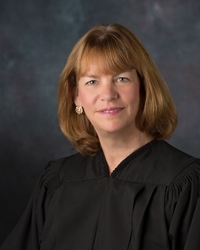 In her brief time on the bench, Judge LaBuda has demonstrated many strengths, including intelligence, knowledge of the law and willingness to grow into her position. We recommend retention, and Judge LaBuda has voluntarily agreed to enter into an improvement plan to address her demeanor and flexibility.